We design and build all types of Flow Control Equipment. Actuators, Hydraulic Control Modules and much more. We will custom design, create job specific CAD drawings, and build and test custom assemblies. Providing rapid response to customers with Controls Issues, our technicians are available 24/5/365 to address your requirements and ensure trouble free operation of all TFC equipment. Whatever your environmental or engineering challenges, TFC comes through for you. 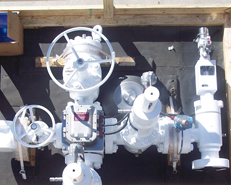 Titan Provides Custom Configuration, Assembly, Controls and Testing for wellheads. We machine and build to your specs. We have rapid turnaround for urgent deliveries and trained field service personnel to deliver, install and service all units we sell. Whether your project is in the Eagle Ford Shale or the Deserts of Iraq our units are there working. If you require more information please fill out the form on the Contact Page. Gas and Air Compression, Power Generation, Pump and other Capital Equipment which Titan has packaged is installed worldwide. We have sixty years of combined experience with OEM's and Fabricators designing, engineering and packaging skid mounted and container enclosed units of all types. We provide explosion proof units for hazardous environments and naturally we install, commission and service every unit that leaves our shop.